The fractional part of the logarithm (called the mantissa) is alone given in the ordinary table of logarithms, and is naturally a constituent of logarithms of numbers intermediate between the above. 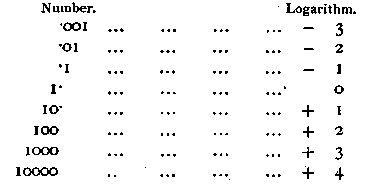 The integer number (called the charac-teristic) is added by the user of the table according to the following rules : - The characteristic is one less than the number of figures to the left of the decimal point; but if the number is wholly decimal, the characteristic is minus, and is one more than the number of cyphers which precede the first significant figure. Example: What is the logarithm of 279? Reference to the table of logarithms gives "4456 as the mantissa or fractional part, while the characteristic will, according to the rule above given, be 2 ; so the complete logarithm will be 2*4456. If the number instead of being 279 were '0000279, the mantissa would still be •4456 ; but the characteristic would be - 5, making the complete logarithm - 5*4456.